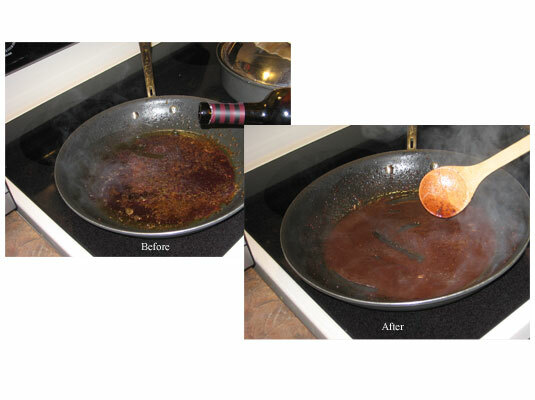 1Remove the meat, poultry, or fish from the pan onto a serving platter and immediately add liquid. You can use water, wine, stock, or a combination. The liquid should be twice the amount of sauce you want to make. 2Raise the heat to high, bringing the liquid to a boil while you stir and scrape the browned bits until they dissolve into the sauce. 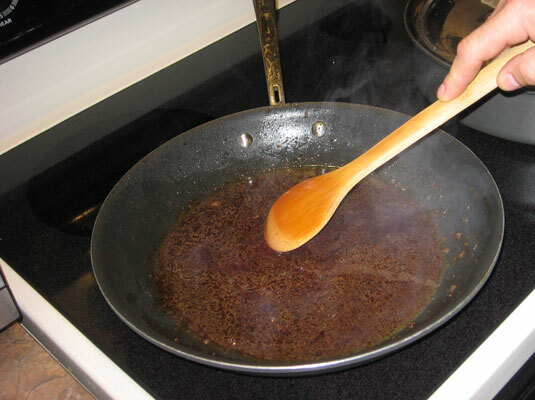 This stirring and scraping is the key to deglazing — all those delicious little caramelized bits of cooked meat infuse the liquid, making it taste fantastic. 3Keep boiling and stirring until the sauce is reduced by half the volume. How can you tell? Just eyeball it. When it looks like you have half as much liquid as you began with, it’s time to take a taste. 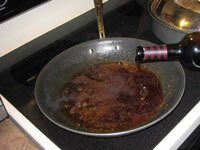 Add more seasoning if you think the sauce needs more flavor. You might also stir in a teaspoon or more of cold butter or some olive oil for flavor and to add a smooth texture.